Could Alien Life Exist in the Methane Habitable Zone? The search for life is largely limited to the search for water. We look for alien planets at the correct distance from their stars for liquid water to splash and flow freely on their surfaces, we "follow the water" on Mars, and SETI scans radio frequencies in the "water hole" between the 1,420 MHz emission line of neutral hydrogen and the 1,666 MHz hydroxyl line. There are two very good reasons why our attention is so strongly focused on water. First, it’s an efficient solvent for biological chemistry, allowing molecules to move around in cells, and it has properties that are friendly to life — a high heat capacity, the ability to remain in liquid form across a wide temperature range and a molecular density that forces molecules to organize themselves, rather than the water organizing around the molecules. Secondly, the biosignatures of a water-based chemistry are a lot easier for us to identify remotely. Moreover, the most important fact about water’s relationship with life is that it is here on Earth. "Some argue that is the only important thing about water," said Chris McKay of NASA’s Ames Research Center. McKay is an astrobiologist and planetary scientist who specializes in hunting down alien environments and then asking the question, "Could something live here?" rather than deciding what is and isn’t habitable beforehand. Suppose, though, that life needn’t be constrained to a water-based chemistry; would we be able to recognize the signatures of such life and the habitats in which it lives? From one perspective, water seems such a good match for life because it may be the only match; no other liquid has the properties or abundance that water has. On the other hand, there is another point of view that says there is more to the story, and that life simply works with whatever materials it has at hand. On Earth, that material is water, but on other planets it may be something else. And we have already discovered another world in our solar system where rivers and lakes are made with a quite different liquid. Saturn, the majestic ringed planet, sits 870 million miles (1.4 billion kilometers) from the sun. Saturn is a gaseous world with an atmosphere of hydrogen and helium, and no discernible rocky surface below. However, among its retinue of icy moons is Titan, bigger than the planet Mercury and swathed in a dense cloak of hydrocarbon smog suspended in its nitrogen-rich atmosphere. Titan is the only moon in the solar system known to have an atmosphere, and it has intrigued astronomers ever since Gerard Kuiper detected methane there in 1944. On Titan, where the temperature is just 94 degrees above absolute zero (minus 290 degrees Fahrenheit; 179 degrees Celsius) water is as solid as rock and liquid methane runs through the river valleys and into the high-latitude polar lakes. Instead of a water cycle, Titan has a methane cycle, and a complex molecular soup formed from reactions in the upper atmosphere between ultraviolet radiation from the sun and methane. Suppose life could exist in an environment like this — it would be a whole new category of habitable planet, one where liquid methane replaces liquid water, consequently leading to an entirely different habitable zone, one that is farther out from a star than the liquid water zone. McKay is already ahead of the game. Along with Ashley Gilliam of NASA Ames and the University of California, Santa Cruz, he published a paper in the journal Planetary and Space Sciencein April that describes where a world with temperatures suitable for liquid methane could be found around a red dwarf star. Red dwarfs — also called M-dwarfs after their classification on the Hertzsprung-Russell diagram — are stars that are smaller and cooler than our sun. Therefore, the planetary systems around them are scaled down accordingly. McKay and Gilliam calculate that a planet would have a surface temperature of minus 290 degrees Fahrenheit (179 degrees Celsius) in a zone between 0.63 and 1.66 astronomical units (61.5 million and 154 million miles, or 99 million and 248 million km) around the star Gliese 581, an M3-type red dwarf located 20.5 light years away. Four planets have already been confirmed orbiting Gliese 581, but none within the "liquid methane habitable zone." Two more planets have been claimed to exist in the system, and one of these would fall within the zone, at 0.76 astronomical units, but evidence for the existence of this world has proven highly controversial. Alternatively, the liquid methane habitable zone around a cooler M4 type red dwarf would be even closer in, between 0.084 and 0.23 astronomical units (7.8 million to 21.4 million miles, or 12.6 million to 34.4 million km). Cold, methane-dominated worlds could easily exist around sun-like stars, and Titan is proof of that. But there are advantages to finding these worlds around red dwarfs instead. First, their small orbital radii make them easier to detect, whether by transits or via radial velocity Doppler shifts. 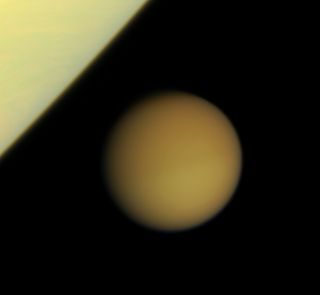 Second, Titan’s atmosphere is opaque to blue and ultraviolet light, but transparent to red and infrared light, and red dwarfs produce more of the latter than the former. If Titan orbited a red dwarf, more red light would seep through to its surface, warming the planet and extending the range of the liquid methane habitable zone. Red dwarfs are also often highly magnetically active, and experience large stellar flares that emit powerful bursts of ultraviolet radiation. While these flares should not irreversibly damage exoplanet atmospheres, according to research led by Antigona Segura of Universidad Nacional Autonoma de Mexico, they could have a different kind of impact on Titan-esque atmospheres, disassociating molecules to create a haze like we see shrouding Saturn’s largest moon. The more active the red dwarf, the more hazy the atmosphere of a Titan-like planet becomes. And the thicker the haze, the colder the surface and the closer to the star the liquid methane habitable zone has to be. Greater or lesser haze also would alter the outward appearance of such a world. If we are to one day hunt for habitable planets in the liquid methane habitable zone, we’ll need to know what they will look like, as well as what biosignatures to search for. It is here that the main stumbling block lies. McKay already has a few suggestions and, tantalizingly, there may even be supporting evidence from Titan. In 2005, he published a paper with Heather Smith of the International Space University in Strasbourg, building on work by Steven Benner of the University of Florida, describing how methane-based lifeforms on Titan (‘methanogens’) could consume hydrogen, acetylene and ethane, and exhale methane instead of carbon dioxide. If such a lifeform existed, it could reveal itself through a depletion of hydrogen, acetylene and ethane at the surface. Amazingly, this is what studies of this moon have actually shown, but McKay himself is dubious that these measurements necessarily mean there is life on Titan. Rather, he points to other, more likely explanations, including mistakes in the modeling of Titan’s atmosphere upon which these measurements are partially derived, to unknown physical processes occurring on Titan that are not related to life. In regards to using this formula to search for life elsewhere, the depletion of hydrogen, acetylene and ethane on the surface of a hazy planet is not conducive to remote spectroscopic imaging from many light years away. "It’s not clear that we would be able to see the depletion of hydrogen over interstellar distances," McKay said. "On Earth, of course, the big biosignature that is visible over interstellar distances is the buildup of oxygen, but even that is not an unambiguous indicator for life, because for most of Earth’s history there has been life but no buildup of oxygen." Nevertheless, Jonathan Lunine of the University of Arizona has speculated that there are many more exo-Titans than exo-Earths out there. If McKay is right about methane-based life, such habitats could vastly outnumber planets with water-based life. The trouble is, the cold temperatures in which liquid methane exists would result in lifeforms with very slow metabolisms. Life would be sluggish. Is there any way it could be warmed up? If warm liquid methane is out of the question, what other potential substitutes for water are there? Hydrogen fluoride comes close to the properties of liquid water, but fluoride is relatively rare in the universe and so is unlikely to play a major factor in life. More common is salt: if temperatures are hot enough, salts will become liquid. "I can imagine a world where there is sodium chloride liquid and salt is somehow the basis for life," McKay said, but he admits it is speculative. Rather than spending too much time on outlandish ideas, he believes it’s better to search for the environments first, and then ask, Can anything live there? Kaltenegger shares the same philosophy. "First we have to figure out using models what it takes for a planet to be habitable, and then we look at the data that comes in about such worlds and see how far we can stretch the habitable definition." Yet of the nearly 700 exoplanets confirmed so far (not counting all the unconfirmed candidate worlds detected by NASA’s Kepler mission), only two are potentially suitable for liquid water, and that’s only on the condition that circumstances on the planets themselves are perfect. As for liquid methane, without some hard data on the properties of methane-based life, astronomers are going to err on the side of caution. Even McKay still favors searching for water-based life and habitats. “We know water works; it’s something that we understand," he said. "Although I argue that we should consider liquid methane, we don’t know that it works. In that sense we’re still guessing." We may be kept guessing until the next mission to Titan, which may not happen until the 2030s. Just as Earth is the template for water-based habitats, Titan is the template for methane-based habitats. However, unless life can be shown to exist there, liquid methane habitable zones will always be passed over in favor of watery zones. Unfortunately, we may be missing a huge chunk of life in the process.